Thai Food, Green Curry Powder Quick Meal. Rosdee Menu Brand Product of Thailand by Rosdee Menu at Smokey Robinson Foods. Hurry! Limited time offer. Offer valid only while supplies last. For a quick delicious Thai dish using this product, Mix water and RosDee Menu Green Curry powder,Stir well and boiled.Add meat and eggplants. 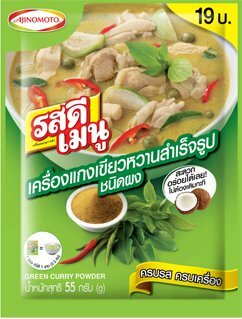 For a quick delicious Thai dish using this product, Mix water and RosDee Menu Green Curry powder,Stir well and boiled.Add meat and eggplants. Sprinkle with sweet basil leaves and fresh large chili. Serve with jasmine rice. Very easy, perfect taste and make you proud to do it yourself. If you have any questions about this product by Rosdee Menu, contact us by completing and submitting the form below. If you are looking for a specif part number, please include it with your message.